Written by Sabrina Kentis, a sophomore Computer Science and Mathematics double major also pursing a certificate in Informatics and Modeling. She is interested in entrepreneurship, technology and social justice. We visited Snapchat, the popular multimedia messaging application, and spoke with several employees there. The San Francisco headquarters, which started in one building has now expanded to the two neighboring buildings as well, showing the company’s rapid growth since the app’s release in 2011. Wesley Evans, a Hampshire graduate with a concentration on the study of organizational behavior and leadership, and now Associate Product Manager at Snap Inc, showed us around the facilities and described his experience coming from a liberal arts college to the tech industry. He also introduced us to several of his associates who described their roles at Snapchat as well as how their jobs influence what we, as users, are seeing on the app. 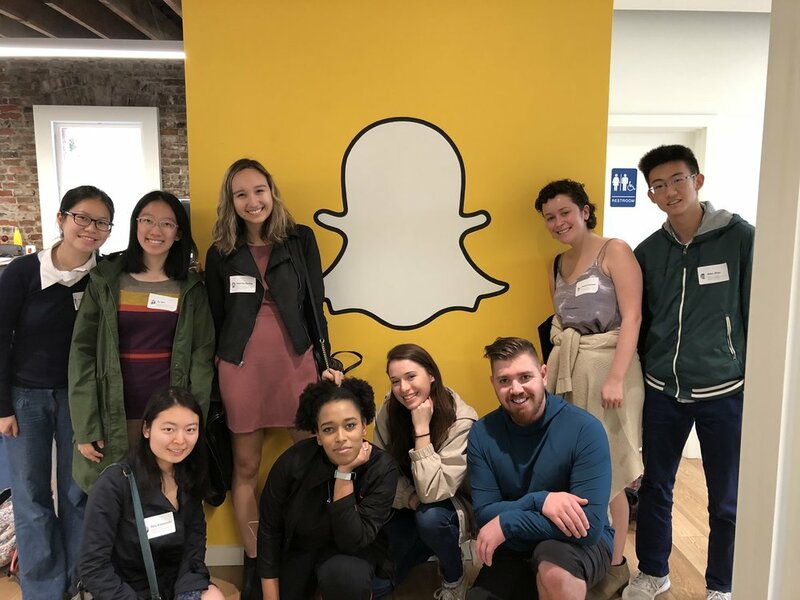 We spoke with Kelsey and Eric who told us about the sales and advertising side of Snapchat and how they work with companies interested in producing content to advertise on the app. Eric explained that in each case Snapchat either has a reactive or proactive approach. Some companies bring a fully developed idea and Snapchat reacts, giving feedback and then posting the advertisement. Other companies communicate their interest in advertising with Snapchat but do not have a clear idea on how to create content adapted to the app interface. In these cases the Snapchat team brainstorms and pitches ideas for an ad campaign. We also spoke with Dustin an engineer at Snapchat who spoke about his personal experience entering the tech world. As a Marine Corps veteran, he had minimal experience in tech and yet, ultimately, he was able to develop programming skills and become successful in the industry. This really demonstrated to our group that it is never too late to change paths and that determination and hard work really can pay off. Overall we had a wonderful time visiting and speaking with some of the members of the Snapchat team. We really enjoyed getting a deeper understanding of the behind-the-scenes of an app we all use so often as well as getting a look at an extremely successful and booming startup in Silicon Valley.